Glad you're still tuning in! I really want this blogging deal to work out! I'm enjoying it so far! It should really help motivate me to always craft more, save more, do more, explore more and enjoy life more. I hope my readers continue to follow me through this journey. Today's project was sweet and simple but it is going to make a world of difference for me! I'm an organized person...I really enjoy organizing my own things as well as helping others become organized as well! It just makes life simpler, I believe. Since getting married and moving out of my parent's home, I had a small collection of sewing supplies but no where to put them! My mom has a cute sewing box that she has had for years but I have yet to find one in a store that I like! I got a clever idea from Pinterest not too long ago and hoped to utilize it one day. 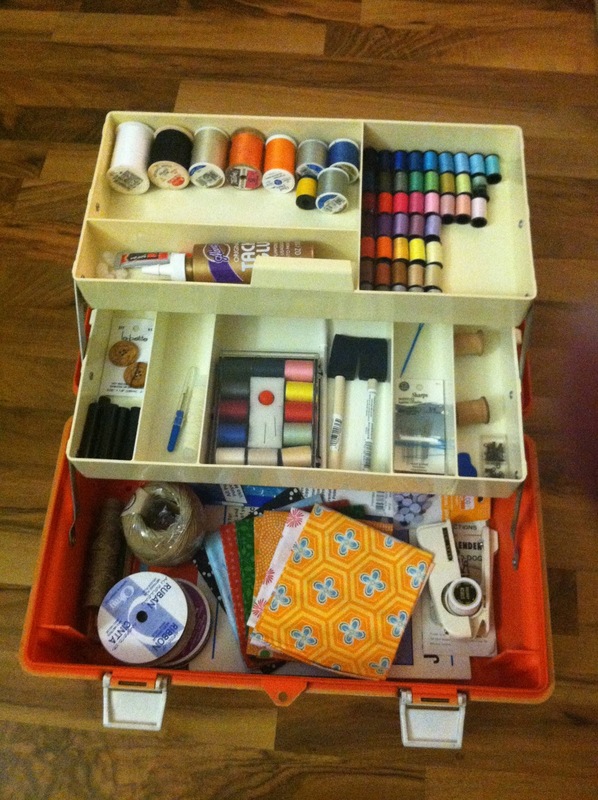 The idea is to use a tool box or fishing tackle box as a sewing or craft box! Side note: Follow me on Pinterest HERE! This past weekend when my husband and I were visiting family we went fishing with my father-in-law and brother-in-law on their pond. My father-in-law mentioned he had a few extra tackle boxes that he didn't use that we could have if we wanted! He had gotten them from the local dump. (Where we come from, the dump is where the locals will drive their own trash and toss it in the dumpsters...we don't pay someone to do that for us! There's also a giveaway pile for things that are too good to throw out but that no one feels like selling, which is where we have found some really awesome stuff! We've even found a great table and chairs set that my in-laws use now!) So we took a couple of tackle boxes, with the intent of crafts for one, and eventually having our own fishing supplies as well in the other. Here's the tackle box I chose for my craft and sewing supplies. Cute, right? Haha well that could be a matter of opinion! The bright orange that's on the inside is what the outside used to look like! Very vintage, which I love. It's clean and has plenty of space for my small collection. This project was easy, all I did was open it up and place everything where I wanted it! The bottom is very open for bigger items like my jute twine and fabric quarters as well as other miscellaneous items. Here are my nicely color coded crummy thread collection! They're not very strong but the multitude of colors has come in handy on many little alteration projects! And these are a few of my regular spools. The darker orange in particular is a favorite because it's a pretty color, it's on a vintage wooden spool, and most importantly, it was one of my grandmother's threads. There you have it! A simple, yet effective way to organize with an old tackle box. Cost of this project: $0.00!! I'm considering making it a little nicer by maybe putting contact paper in the compartments. What do you think? How would you spruce up this plain, old tackle box?